This year’s Bachelor in Paradise was filled with drama, wandering eyes, and love. Although a lot of couples decided to end their relationship and go home, there are some who made it through, even though they didn’t get engaged. One such sweet couple on Bachelor in Paradise is Raven Gates and Adam Gottschalk. At the moment, Bachelor in Paradise fans are gushing over Taylor Nolan and Derek Peth’s engagement after watching the show. Nolan and Peth were one couple on the show who had eyes for each other from the start. Although they had their share of arguments and differences, they still managed to overcome them and are looking towards a marriage together in the future. Taylor Nolan finally got her happy ending and went home with Derek Peth in a Neil Lane engagement ring. However, they are not the only lucky couple who found love in Paradise. Another sweet couple who is not yet engaged but are in a relationship is Raven Gates and Adam Gottschalk. Although others got in the way of their relationship, in the end, they managed to find each other. So, are Raven Gates and Adam Gottschalk dating after Bachelor in Paradise 2017? Keep reading, as we spill some juicy details about their relationship. Also Read: Derek Peth Hometown: Where Is Derek Peth From? Are Raven Gates and Adam Gottschalk Together? At the end of season 4 of Bachelor in Paradise, Gates and Gottschalk decided to accept the Fantasy Suite date. Initially, Gates was a little reserved about trusting Gottschalk because she has had her heart broken several times before. However, Gates decided to trust her instincts and Gottschalk and agreed to it. And after their Fantasy Suite date, it looked like their relationship became stronger than ever. In fact, after their date, Gottschalk told the cameras that he can see Gates and him as the next Carly and Evan. He also added that there is a possibility of them getting engaged if their relationship works out. According to sources, Raven Gates and Adam Gottschalk are still romantically involved with each other, despite living in different states. For now, there is no proof in the form of photos or statements that the couple has met each other’s family. But sources claim that Gottschalk has already met Gates’ parents in Arkansas. There was also news that Gates was planning to fly down to Dallas to meet his folks, as well. There are also rumors that Gates met Gottschalk’s family during the Labor Day weekend. 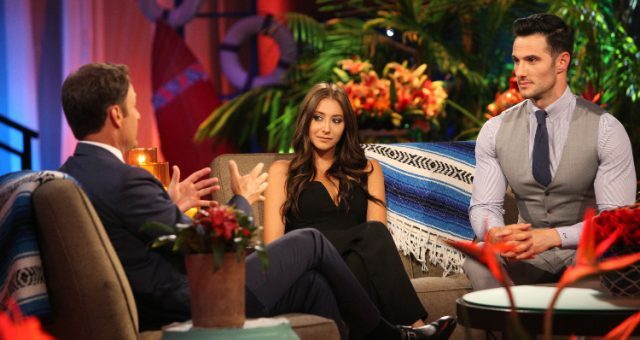 In fact, he ended up meeting Gates’ parents during the live audience show of Bachelor in Paradise. Having said that, it looks like the couple is still going strong. Also Read: “Bachelor in Paradise” Finale: Are Taylor and Derek Engaged? Are They Still Together? Why Didn’t They Get Engaged? It seems like Raven Gates and Adam Gottschalk want to take their time to get to know each other before putting a ring on their fingers. Also, before getting engaged, they need to discuss if Gottschalk would want to live in the same city as Gates. But if Gates plans on moving to Dallas, then she needs to move her boutique, too. So for now, they are taking it slow, and they will get engaged when and if the time is right. There’s no denying Adam Gottschalk and Raven Gates make an adorable couple. But for now, the couple wants to take their time and gradually take the next step. Fans have a strong feeling that soon they will get hitched. During an interview, Adam Gottschalk jokingly said that he promised his lady love a huge wedding proposal. So, we are keeping our fingers crossed for this one!